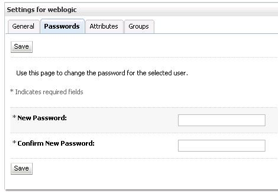 Since Weblogic stores it’s primary admin user account “weblogic” encrypted on disc, simply changing this users password in the console is not all there is. During step 3 we will change the NodeManager password. After this step the Admin console can no longer communicatie with the NodeManager so stopping/starting instances will not succeed. Launching the ManagedServer through the Startscript will test the result and encrypt the content. This is very helpful. I am trying to change the admin password for my OSB domain. I have seen another post somewhere online that says simply updating the admin server boot.properties file then restarting the admin server and all the managed servers in the domain. Would that achieve the same purpose? I am somewhat new to OSB and is trying to understand the difference in updating the password in the console vs. in the boot.properties file. Any help would be appreciated. hello Grace. The boot.properties or nm_properties are used to start the managed server and make sure they can connect to the admin & domain. I think you should need to change the password in Weblogic itself to make sure both are in sync. I never tried the “only-admin” boot.properties modification, but if you tested it and it works please let me know. There is a typo here. Please change nm_properties to nm_password.properties. Just so that new bees like me don’t get confused. Weblogic server version – 10.3.6. Executed the above steps.But after this change the user is getting locked out. But the server is starting up without any issues.Kept the node manager server down and tried the same.Still the issue exist. Pasting logs for above issue.